CHIEF STATE OF MIND: Earning Your Stripes. In this lesson, Lefford outlines his life experiences to outline the origins of his “Earning Your Stripes” concept. Understanding is designed to help you grow towards your life’s vision and purpose. Lefford explores the fundamental nature of honesty as a personal attribute. He shows you how to develop, nurture and maintain your own authenticity to bring a new clarity of purpose to your life. In this vital Stripe, Lefford shows you how your vision begins to reveal itself from within and how it can become a powerful tool to guide and direct you in living a meaningful life. Lefford teaches that living our vision minute by minute requires a foundation of persistent action. In this Stripe, you will learn how to meet any task with purpose, passion, and inspiration. Recognizing that the quality of your life is in direct proportion to your ability to focus, Lefford examines how we order our lives, teaching us how to harness the power of concentration to achieve the specific outcomes we desire. Courage can be developed! In this Stripe, you will learn to anticipate the obstacles, fortify yourself with understanding and present yourself, authentically, from the heart, through full self-expression. Learn to recognize and embrace your intuitive capabilities. As Lefford teaches you to open your mind and heart to the sources of this inner power, you will begin to recognize the new opportunities and take control of them in fulfilling your life’s purpose. True leadership emerges from a strong internal truth and vision. Lefford shows you that by living authentically you will be able to master the essential attributes of leadership and learn to inspire others and yourself to success. “I believe accomplishments are faith in action, “Lefford begins. In a transforming lesson on faith, Lefford demonstrates that giving, creating and contributing, are the building blocks upon which your Faith will abound to a richer and more fulfilling life. In this last Stripe, Lefford directs us in understanding that giving is an act of intent, of focus, and of reflection. In learning to give properly, you will reach a new level of self-awareness, in harmony with the world you and the person you desire to become. For Purchases of 11 or more CD Sets, please contact me for the special bulk price. 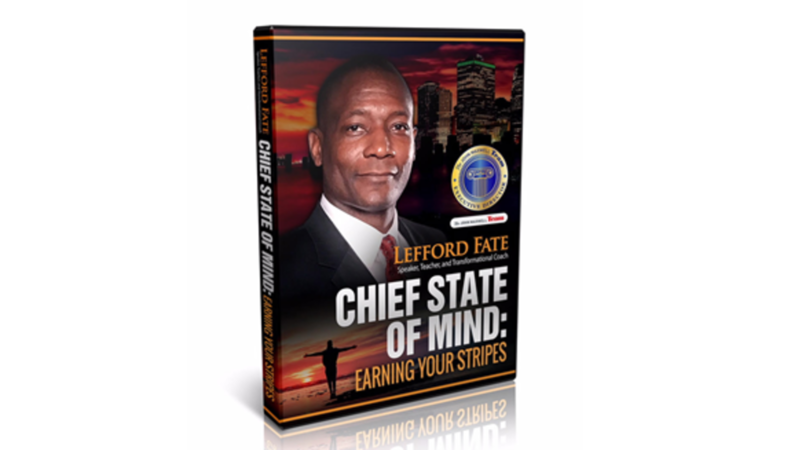 Chief State of Mind is the culmination of Lefford Fate’s study and work in the field of personal development. In these 10 lessons, Lefford will help you to create your own learning model for achievement.